The unemployment rate for individuals with developmental disabilities such as; Autism, Down syndrome, Intellectual Disability and Cerebral Palsy is 84%. 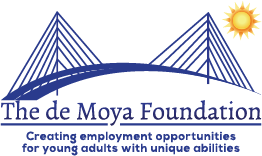 The de Moya Foundation is determined to increase employment opportunities for young adults with unique abilities and decrease the unemployment rate. One of the most important responsibilities when it comes to having a job is arriving on time. The young adults supported by The de Moya Foundation know this, however, transportation is unreliable and makes it difficult to get to work on time. As a result, we are incurring costs to help maintain their jobs by providing Uber and Lyft rides. Your help can change this! Please donate $25, $50, $100 or whatever amount you can and BUY A RIDE to assist young employees with unique abilities with transportation. Make a one-time donation to support young adults with intellectual and developmental disabilities. Make a difference all year by becoming a community partner with your monthly donation.